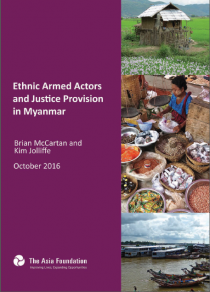 This October 2016 policy brief from The Asia Foundation sheds new light on justice provision by ethnic armed actors. Research into some of Myanmar’s most prominent Ethnic Armed Organisations and state-backed paramilitary organisations illuminates the various rule of law dynamics in their areas of influence. This guide is an excellent hands-on resource for starting or improving a paralegal program. It includes case studies from Cambodia, the Philippines, and around the world and is available in English and Myanmar. For more information, see Namati’s comprehensive web-based guide and their Myanmar Facebook page. This short February 2016 guide from The Asia Foundation considers how policy institutes can effectively support the policy making process in Myanmar. 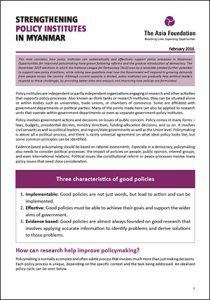 It suggests that as policy institutes grow and strengthen, they can assist political leaders by providing better data and analysis to improve how policies are formulated. 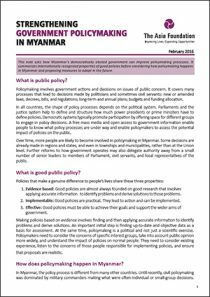 This February 2016 guide from The Asia Foundation explains what public policy is, what components go into good public policy, and how the Myanmar government can strengthen policy formulation.